Yes, there was a time when Nutella was not taking over the world by millions of fans. There was a time, when I was a little elementary school kid and had to down a glass of hot milk mixed with honey every morning instead of chocolate spread on a piece of toast for breakfast. Boring! I don’t remember those days much. But I do remember getting my hands on chocolate spreads. For Turkish kids, these chocolate spreads with hazelnut and hazelnut pastes have been the first introduction to the chocolate-hazelnut marriage and believe me that marriage between these two ingredients are the strongest one I have ever seen. Combine a Turkish’s dedication to sweets with Turkey’s highest hazelnut production in the world…And you get Cokokrem and Sarelle … two brands that have been going strong in Turkey as long as I can remember. Cokokrem and Sarelle were the first names I remember that are associated with fun breakfast. And of course two most vivid memories of my childhood are will be about them, too. First one is when I was at an age where you can remember only patches of your life rather than as a continuous story. Maybe 4, maybe 5. My mom dropped me at my grandparents’ house that day, just like any other day she went to work. I remember leaning against the back of my grandparents’ couch, watching the snow fall down on Talatpasa Avenue, tapping my feet to the music from the radio. And somehow that day, I had a Cokokrem tube in my hand. I was mesmerized with chocolate coming out of this toothpaste tube looking thing. A WHOLE TUBE of chocolate. I am not the one, to this day, who carefully tries to squeeze the toothpaste out the tube by rolling up the used part, making sure every bit of the paste squeezed out of the tube. Unless, there is chocolate coming out of the tube! I remember carefully licking the little opening, squeezing from the bottom so very slowly, patiently waiting for the snow to build up so I could go out and play in the yard. I do not remember if I finished the whole thing or if they took it away from me at some point. 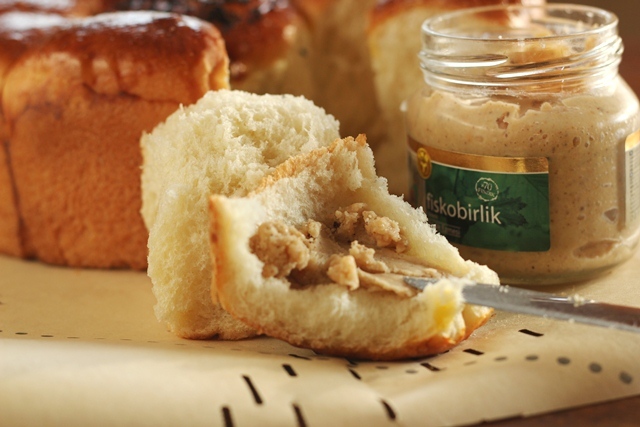 As I grew older, the market also grew and Fiskobirlik, official hazelnut institution established in the early years of the Turkish Republic, put out their own products. The chunky hazelnut spread without chocolate became my favorite. There was nothing creamy about it. Crushed hazelnuts blended with sugar, hard to spread on bread but easy on the tastebuds. I am no more the little girl who was sucking the chocolate spread out of a tube lazily on a snowy day. I get up early, work hard, can’t sit still and always run around with a to-do list in my hand. That is simply why I need more of each! Really interesting post! I learned so much, and this was so much fun to read. Who wouldn’t want a whole tube of chocolate?! Good stuff – thanks. mmm..chunky hazelnut spread with chocolate…I am going to visit one of my Turkish stores for some filo pastry next week…hopefully I can find some chocolate spread too. I think I must be the only person alive who does not like Nutella. I think perhaps it is a little too sweet for me and the chocolate not dark enough. When I was a little girl I probably would have loved it. I think I would prefer the Turkish hazelnut spread without the chocolate too. An amazing post Ilke! Enjoyed reading each line! 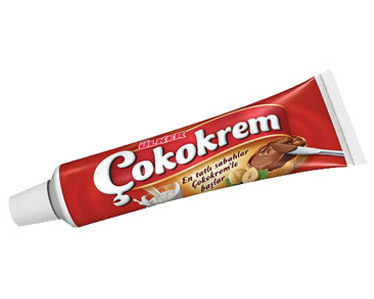 You took me to my childhood when I first met with cokokrem. Breakfast was never boring for me, but it became a feast with that chocolate spread! I haven’t seen Fiskobirlik products at markets, I will definitely look for it next time I go shopping. After our trip back then, I couldn’t forgive myself for not bringing back some hazelnut spread!!! This, is a must on our next trip!!! We have, I think it is, Cokokrem in the supermarkets here ;-) Never bought it yet though. And the chocolate fountain sounds like the most fun thing!